There are quite a few recipes out there for gluten-free crêpes (French pancakes). The difficulty is that the lack of gluten makes the crêpes harder to make since they tend to fall apart more easily. I spent a couple of weeks testing out different variations (am all crêped-out!) and have 3 separate recipes, including the traditional French recipe for galettes. Galettes are the typical savoury pancakes from Brittany made with buckwheat flour that offer a great base for breakfast, lunch or dinner! The three recipes are all made pretty much in the same way but use slightly different ingredients. I have chosen to make these recipes with neither dairy milk, nor the addition of any sugar or other sweetener so they are healthier and may be used with either savoury or sweet filings. All of them can be made with dairy-based milk products. If you wish to make them vegan, I would suggest experimenting with flaxseed or chia seeds since these help with binding the batter (which is what eggs usually do) but I have not attempted it myself so can’t comment on amounts or outcome! A word about what pans to use. Using a non-stick pan for crêpes is definitely easier but most non-stick coating, as well as aluminium-based pans, should be avoided since they can be toxic to your health. The best option is to get a specialty crêpe pan made with a stainless steel base and ceramic non-stick coating. Alternatively, for the more expert crêpe-maker, try one of the specialty cast iron crêpe makers. Normal stainless steel flat pans can also be used but you may need to make 2-3 crêpes before a non-stick patina is made with the oil used to coat it. 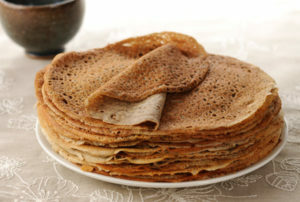 These crêpes are probably the easiest to get right (the corn flour helps them slide off the pan easily) but probably the least nutritious of the 3 since both rice and corn flours are high in carbohydrates and have relatively high glycemic indexes (common even when whole grains are transformed into flours). Using the whole brown rice flour in this recipe improves this a little. Adding some ground flaxseed could add fibre and healthy fats and improve the nutritional aspect, as will the filing you decide to add. These crêpes do not keep well once made because the corn flour tends to get hard on cooling, even if covered in the refrigerator. It is best to keep the batter refrigerated and use as needed. I really like this recipe because of the smokey yet slightly sweet flavour that chestnut flour gives to the crêpes. And chestnut flour is a relatively low GI food so it makes them slightly more nutritional than the ones above. These keep quite well for day or so if refrigerated but the better option is to keep the unused batter refrigerated and make some fresh. The real galette recipe in Brittany is, according to the keepers of the tradition, made with only 3 ingredients of the best quality: buckwheat flour, water and sea salt. An egg is allowable. Because of the lack of gluten, it is difficult to make without an egg, so I usually add one in. It also needs to be whisked energetically for a while (at least 5 minutes) to allow air bubbles into the mix to give it the typical lacy pattern. Some people add fizzy water or even beer instead! This recipe also requires the longest resting of all of the recipes – a minimum of 4 hours – and it should be sealed or covered with paper to allow for fermentation. I do recommend the original recipe (with an egg) but you can also add dairy or non-dairy milk. If you don’t have an issue with gluten, some wheat or spelt flour to help with binding (but it should be no more than 30% of the total amount used). Galettes are usually used to make savoury crêpes but I actually love these with a bit of slightly salted organic butter and some raw chestnut honey! They make great bases for a healthy savoury breakfast, lunch or dinner wrap. You will need 1 medium/large bowl and 1 large measuring cup (or another bowl), a whisk, a ladle, a batter spreader (helps to make crêpes thin), a flat turning spatula and a crêpe pan (or similar), some paper towels and some olive oil for the pan (unless non-stick). Pour and mix flours in a medium/large bowl, add salt, lemon zest and vanilla (where relevant). Beat eggs together in the measuring cup (just enough to liquify), add the milk/water and the olive oil (except for galette recipe) and mix them together. Slowly pour the liquid mix into the flour, whisking slowly as you add the liquid to avoid lumps. The crêpe mix should always be left to rest for at least 1 hour. You may need to add a little more liquid depending on the consistency/thickness after resting. Ideally crêpe batter should have the consistency of liquid cooking cream but the best way to test it is to make one and see if it is thin enough (note that the corn flour crepes may be slightly thicker than the other two). If you don’t use all of the batter, you can always refrigerate it – it keeps quite well for at least a day or so. In France, we usually enjoy our crepes with a bolée (a kind of bowl) of cidre brut (nothing to do with English cider or American apple juice)! Yum!